Thomas Jefferson’s signature is one of the most widely recognized of all the presidents’ – a true testament to his legacy as one of the most influential Americans ever to live. Jefferson inscribed his signature on everything, from the Declaration of Independence to his personal collection of sterling silver tumblers. 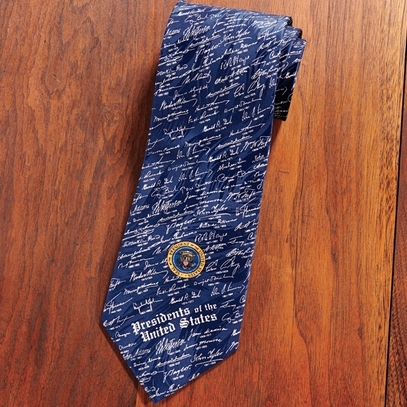 This handsome navy blue necktie features the U.S. Presidential seal among signatures of U.S. Presidents including Thomas Jefferson’s. Hand-tailored pure silk, fully lined. 3 7/8"w.